Welcome to "What's Actually Good," the column that looks at what's to come and what's currently out in the colorful world of comics. In this issue, I resist the urge to use the horribly generic vampire pun 'sink your fangs into this' when I discuss Whedon's Buffy Season Eight and discover that you can actually buy a Green Lantern ring over eBay in preparation for Green Lantern: The Blackest Night. My childhood pretty much consisted of three things: watching Buffy the Vampire Slayer, playing Goldeneye on the N64 and reading Amazing Spiderman comics. It was a good time for me. So, along with Bond and Spidey, Buffy has a special place within my adult psyche. As it goes, Joss Whedon's Buffy the Vampire Slayer Season Eight has now been published for an entire year, so (in lieu of a Goldeneye comic) I felt it was time to weigh in. Continuing directly from the events at the end of Season 7 with the entire town imploding and hundreds of Slayers roaming the world, Season 8 continues the story of Slayer extraordinaire Buffy and her hapless comrades. With the destruction of Sunnydale, the team has relocated to a castle in Scotland that serves as a base of operations and training ground for the Slayerettes. 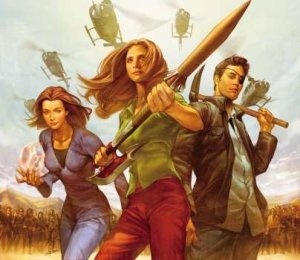 With these changes comes an interesting shift from the original series: Buffy is now the leader of a new world power. Kickass! This obviously upsets the other power bases, provides the foundation for the first story arc and draws on a major theme throughout the entire series. Whedon has wisely taken the same level of creative control over the comic as he did with the TV series. He writes key stories here and there, but otherwise allows different creative teams to fill the gaps with their own tales. This has worked well, mostly due to the quality of the fill-in writers. Brian K. Vaughan wrote an excellent 4-part story titled "No Future for You" featuring Giles and Faith, and long time Buffy TV writer Drew Goddard has most recently begun a new story arc. What we have, then, is a series built under the watchful supervision of Whedon with contributions by some of the best in the business. Success! One can't help but wonder if the greater comic industry would do well to adopt this TV-like model of development. The artist for most of the series so far has been Georges Jeanty, and he has supplied us with a solid, if a little generic, 10 issues of pencils. Allow me to quickly explain what I mean when I say "generic": He is well suited to the role, no doubt; his artwork is clear, concise and for the most part captures the characters perfectly. When I say "generic" I simply mean the artwork won't blow your mind, but instead simply satisfy it. It expresses the stories well and that's all that is required. Some exciting things have happened, including some characters coming back from the dead as well as some more ... controversial changes. I am too professional to include spoilers within my reviews, so I will allow this news report to do it for me. Click it for spoilers regarding the latest issue of Buffy, and enjoy. The series is building upon the Buffy stories of old while going in a new direction that's sure to keep both original fans and newcomers happy. The next issue will be available April 4. Check it out.